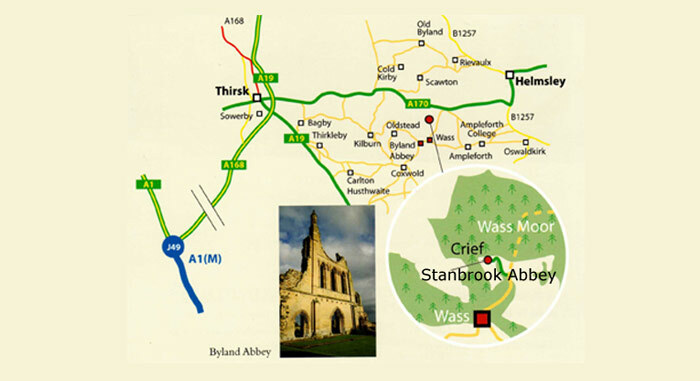 There are frequent trains from York to Thirsk which is our nearest railway station (12 miles away). No buses from Thirsk but taxis know where we are. Stephensons run buses from York to Wass (Tel: 10347 838990). Check times with them. There is a steep walk of about a mile from Wass village to the monastery. and follow the directions below. Turn off A1/M1 link at A168 towards Thirsk. Cross the A19 and join the A170 to Scarborough. Go through Sutton-under-Whitestonecliffe and up to Sutton Bank. Turn right some distance past the Sutton Bank Visitor Centre down road signposted 'Wass & Byland'. The drive of the Monastery and Crief Lodges is on the right just as you begin to drop down steeply into Wass.